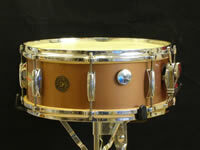 Exquisite and ultra rare, this Gretsch copper mist nitron snare drum also came with the rest of the kit, which includes an 8x12, 14x14 and 14x20. 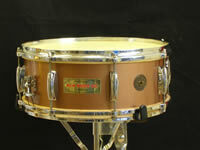 The nitron finishes were among the rarest Gretsch finishes ever produced. This snare drum comes complete with the original calf heads. The rest of the kit is in excellent condition as well. The nitron finishes were not wraps, and as a result, they can often be badly chipped. This kit is in remarkably good shape, especially considering that it is approximately 45 years old! Another noteworthy item is the exterior badge that identifies the music store that originally ordered the kit from Gretsch. The badge is affixed to each drum, and this practice was not uncommon in the 50s and 60s. This kit now belongs to a very good friend and vintage drum collector.